Season one is officially over but we are already planning out next year. This week started out on Monday night with a meeting in Lexington regarding the Rock n' Roll Half marathon in Las Vegas in December. It was nice to see the Team Challenge people again and I saw one of my friends who I met in Australia, Tim Groves, and his sister are also now officially a part of Team Challenge. So the meeting went well but we are not positive who will be doing Vegas yet. On Tuesday night we had a meeting with committee members, Carol Lang, Stephen Marcus, Carol Augustyniak, Walter Mirrione, Jonathan Adams, Raegan Avidon, Sean Grover, and newly inducted members, Duncan Payne and Stephen Ivanoski. First we recapped the year that was in fundraising. We went around the table and had everybody say their most favorite and least favorite parts of the campaign. Highlights were the L O C O event, poker night, and the yard sale as well as the marathon and half-marathon weekends. We also did a silent vote on inducting new committee members. The candidates were Stephen Ivanoski, Duncan Payne, Doug King, David Mudd, Peter Westhaver, and Katie Mulcahy Wells and they were all voted in unanimously, as we are still looking for more members. Ivanoski has been a long-term friend of mine and was supposed to run the half-marathon in July before a terrible car accident. He promises to devote some of his fundraising events at his school, Massachusetts College of Pharmacy for his fraternity Kappa Psi, to Team Challenge. Payne has also been a friend of mine for about 15 years and has recently been committed to endurance training. He ran the Boston Marathon this past spring in 3:34. He also just ran the Falmouth Road Race this past weekend in 48 minutes and plans to run a half-ironman next weekend and has raised about $5,000 for the Pat Tillman Foundation in just over a month. Doug King has been a great friend and associate of my father's and I've also got to know him over the years. He has been very generous over the years and recently donated a HUGE amount to start us off for the 2012 campaign. David Mudd is my father's MD and has been a family friend over the years. He has been involved with Team Intestinal Fortitude and we imagine it will be helpful to have a doctor on our team. I do not know much about Westhaver or Wells but my father praises them well so I trust they will be great additions. The next point may cause our fundraising site to self-destruct. We are in the talks of a website change mainly because of the web site fees and the fact that Team Challenge utilizes another fundraising site. We will most likely stick with it due to the many functions and helpful tech support of myevent.com. The next portion is regarding who should run the Las Vegas half marathon. My sister, Alix, is very interested as am I. Other possibilities include committee members Brian Teague, Duncan Payne, and Stephen Ivanoski. The issue with this is that it will cost $3,700 for every particpant. We will most likely not be the number one fundraiser for Vegas as we are focusing on the summer season to have our huge events but we figure this could be fun. Other topics included: doing the restaurant (L O C O) event next year, poker event may be twice a year (October/November before Vegas and then in the Spring), and to repeat the yard sale. Another topic is to do a flash mob which will most likely be headed by my sister and mother. This will not only raise some money but will also increase awareness. Additional running plans for myself include hopefully running an October marathon (either Hartford or Lowell). I'm still undecided on this because I will be interning in New York, taking two courses at Fordham, and possibly taking the LSAT. 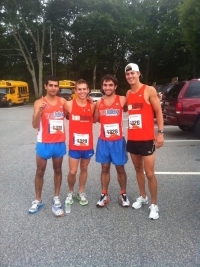 This past weekend we did the Falmouth Road Race. I'd like to thank CCFA for giving us numbers for this event as my friends, Mike Moverman, Brian Cohen, and committee member Duncan Payne all competed. I ran 43 minutes which was a bit worse than what I wanted but this was definitely the toughest week yet and I am adjusting to recent high mileage. I've ran about 60-70 miles these past three weeks after not doing over 40 since the marathon so I'm definitely having heavy-leg syndrome. This week I did a logn run on Monday of 18 miles, an easy 50 minute run, easy 80-minute run, and 8x800 meter workout progressing from 2:50 to 2:30, a couple easy 50-minute runs and then the 7-mile race. It was definitely a tough week but the atmosphere at Falmouth was really great. Lots of high-fives, lots of smiles, and lots of hugs. That was pretty much the mantra. Anyways, I'm ready for another year. We will work harder and hopefully will be the number one fundraising group again. As well as increase awareness. Until next time, peace. I am all for a flash mob!